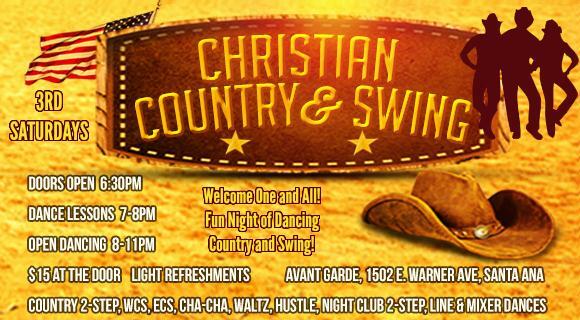 Join us at the CHRISTIAN COUNTRY & SWING on Saturday, April 20 from 6:30-11:00PM. Don't miss free dance lessons from 7:00-8:00PM. It's Easter weekend and we would love to see you there! Thank you for a great turnout at our St. Patty's dance with 120 people dancing with us. You won’t want to miss our dance this month. Come out and have a great time. Invite your friends and meet new people. Includes complimentary appetizers and desserts. WANT TO LEARN HOW TO DANCE? We offer free and fun dance lessons and mixer dances. *7-8PM - LEARN THE DANCE BASICS or get a refresher learning East Coast Swing, Country 2-Step and Nightclub 2-Step. DJ’s provides the best country music dancing to: Country 2-Step, West Coast Swing, East Coast Swing, Cha-Cha, Waltz, Hustle, Night Club 2-Step, Line & Mixer Dances. - Fun Night of Dancing Country and Swing! - All for ONLY $15 at the Door! - FREE Dance Lessons & Refreshments! Join us on the 3rd Saturday Monthly for a fun night! Previously the Christian Country Roundup (CCR) with Michael Sloat.